The effect or practice of concealment. Camouflage can consist of actual artifice, for example wearing a mask or a costume or of covering one object with another. Camouflage also occurs naturally, enabling animals, including humans, and plants to blend into their surroundings, either to facilitate hunting or hiding, depending upon which end of the food chain it is. 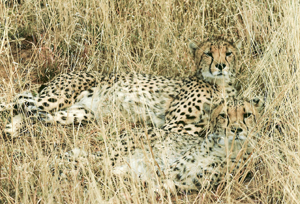 "Cheetahs hiding in plain sight" by Brigitte Werner is licensed under Public Domain.